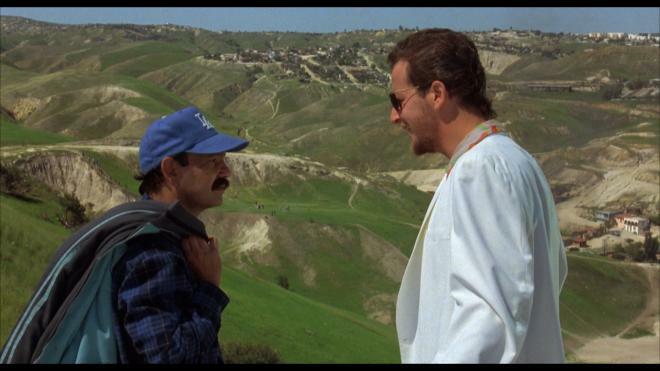 Comedian Cheech Marin steps into the director’s chair for his border-crossing comedy in 1987’s Born in East LA. Marin stars as an American citizen fighting the immigration system after being mistakenly deported to Tijuana. 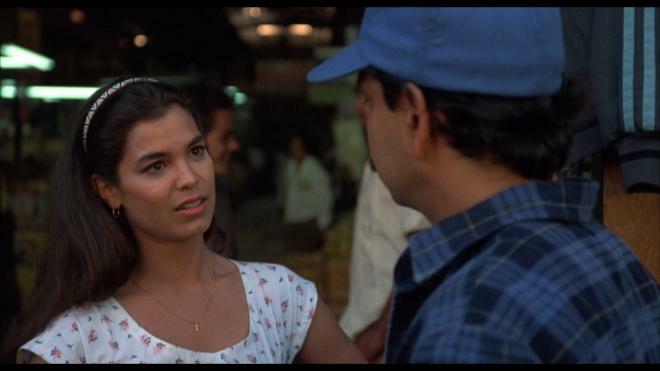 A cult hit within the Latino community and beyond, the film successfully combines Marin’s zany comedy with a sobering perspective on our broken immigration system. Shout! Select brings the 80’s comedy to Blu-ray for the first time with a respectable A/V presentation and a bevy of bonus features sure to seal the deal for any fan of the film. Call up a few Disco Bunnies for movie night cause this one is Recommended. Laid-back mechanic Rudy (Cheech Marin) just wants to cruise in his pink convertible, play guitar with his friends, and oogle French girls. After a busy morning at his mother’s house, he heads out to pick up his Mexican cousin Javier downtown. 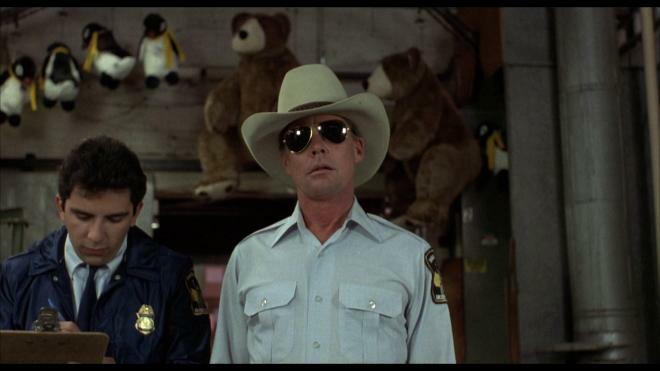 Ironically, Rudy speaks no Spanish and Javier speaks no English. When he finds the factory where Javier is supposed to be, immigration officials bust the place for hiring illegal workers and mistake Rudy for an illegal immigrant and questioned. When he can’t produce a photo ID or remember the name of the President, they throw him in the truck headed for the border. Arriving in Tijuana, he soon experiences the racism and inhumanity inherent in the system while becoming part of the community hell-bent on getting to America. Born in East L.A. is a moving story of humanity and politics masquerading as a zany comedy. Marin’s film pokes fun at nearly every aspect of the immigrant’s journey as well as our own pitfalls as a country dealing with the issues. His humor lands without too much controversy, though some jokes and characters are dated. The messages are clear and presented with enough heart and humor keep the proceedings from becoming preachy. It comes as no surprise to me that Shout! decided to release this film now with our current climate on immigration issues. Where Born in East L.A. succeeds is in making the world of border crossing, immigration, and East L.A. Latino culture so accessible and relatable. Seeing the film on VHS back in the early 90’s I was blissfully unaware of what was going on with illegal workers coming to America. Cheech Marin’s humor provides an easy conduit through which we can understand the plausibility of Rudy’s troubles and what it takes to cross the border. Choosing to slip the social messages of the film into the hijinks and goofiness was a wise decision. Where the film loses steam is in the recurring scenes with Rudy working the various side hustles for club owner Jimmy (a solid Daniel Stern as an expat sleazebag). With the tempo of a Looney Tunes cartoon, Rudy bounces around his various gigs in Tijuana hoping to make enough cash to hire a coyote to get him back home. It becomes a bit boring and drags the film even with its modest 85-minute runtime. Marin provides some really funny material for Rudy here that showcases his improvisational talents. Unfortunately, the stakes are pretty low in the film because the comedy works so well to just shuffle you along the story. Sit back, relax, and let the jokes work their magic! Supporting cast members are spot on with their performances. It’s clear Marin wanted to fill the movie with common faces you’d see in East L.A. and Tijuana, which helps the film’s look but also allows it to reach a wider audience. Adding Kamala Lopez, Tony Plana, Paul Rodriguez, and Lupe Ontiveros elevated an otherwise low budget comedy to one that still resonates with audiences on both sides of the border. My one gripe is that there weren’t more scenes with Paul Rodriguez as Javier. Examining the flipside of Rudy’s situation might have proven a success just to see Javier navigate the streets of L.A. Between the kookiness, reminiscent of Cheech and Chong, Born in East L.A. is a funny comedy worth checking out. Audiences new to the movie will dig the humor value and ask their friends “WAAS SAPPENING?” the next time they meet up. Born in East L.A. may have started out as a parody track on a Cheech and Chong album but the irony of the song was turned into a great 80’s comedy with social messages that still resonate today. From the winking Jesus portrait to the stark realities facing families at the border this is a silly movie with heart. Shout! 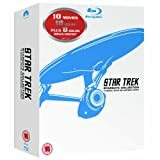 Factory smuggles Born in East L.A. to Blu-ray in a single disc Collector’s Edition release as part of their Shout Select line with spine number 70. The disc is housed in a standard Blu-ray case with a Shout Select insert and loads to a static Main Menu screen with typical navigation options. Presented in 1080p with a 1.85:1 aspect ratio Born in East L.A. makes the jump to HD with satisfying results. The transfer looks decent with generous film grain and solid primaries anchoring the presentation. 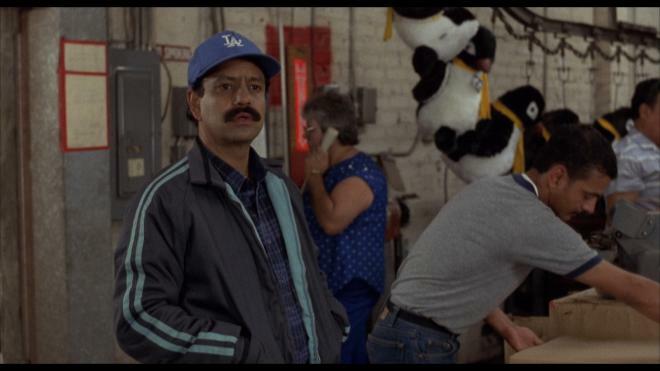 Rudy’s bright blue Dodgers hat rings true throughout the film, highlighting his presence in every scene. Otherwise the image is a bit stale with fine detail lacking save for closeups and some medium shots. Artifacts and dirt are instantly present but don’t detract from the film’s presentation. Those scratches gives it a patina us old timers are excited to see! Black levels waver during nighttime scenes but remain solid in costuming. On the U.S.A side of the border, we’re treated to an 80’s neon color palette that is vibrant but lacks an intensity I’d expect from this Blu-ray. Shout! Factory’s Blu-ray is a good presentation without too much tinkering or cleaning. A new 2k scan would’ve been the icing on the cake for this release. Retaining the film grain and artifacts in the image allow old guys like me to enjoy a funny film and remember the times when our President wasn’t a TV star. Oh, wait. Born in East L.A. asks “WAAS SAPPENING?” in a passable DTS-HD MA Mono 2.0 lossless audio track. The sound mix provides a nicely balanced presentation that never weakens throughout the course of the feature. Dialogue is presented clearly within the mix without hiss or distortion evident. It isn’t the best way to experience the film, but it’s no slouch either. From the opening beats of the title track Born in East L.A. sounds confident on Shout! Factory’s Blu-ray. I kept the volume at a medium level to soak in the music and never miss a bit of the outrageous dialogue. One glance at the bonus features and fans will want to upgrade their old DVDs in a hurry. While the interview featurettes and commentary are worth checking out it’s the Extended Television Cut of the film that seals the deal on this home video release. Waas Sappening? A Conversation with Cheech Marin (HD 31:19) - Cheech Marin speaks candidly about the film’s origins and production with plenty of anecdotes worth hearing. Produced exclusively by Shout! Factory this interview featurette is essential viewing for fans of the film. Who You Calling Stupid? A Conversation with Paul Rodriguez (HD 13:36) - A great interview with the comedian in which he speaks not only about his experiences with the production but also its lasting significance. Produced exclusively for this release by Shout! Factory. What is Disco Bunnies? A Conversation with Kalama Lopez (HD 14:25) - While relating her positive experiences with the film, Kalama devotes her energy in this interview to praising Marin’s work ethic and the film’s impact on the Latino community today. Extended Television Cut of Born in East L.A. (HD 1:33:56) Some reviews are reporting this is a 1.33:1 image but on my review disc this was a widescreen presentation in the same 1.85:1 found on the theatrical cut. With a much different ending than the theatrical cut this is the version most people will remember. Kudos to Shout! Factory for including this on the disc. Stills Gallery (HD 2:01) - slideshow of production photos, headshots, and marketing photos. Production Notes (HD 2:46) - Slideshow of pages from Universal Studios’ notes on the film. Born in East L.A. is a lighthearted 80’s comedy that addresses the injustices of the American immigration system and the lives shaped by it. The film tackles a sensitive subject with the flair you’d expect from a Cheech Marin film which means funny performances and a high quote-ability factor. This is Cheech Marin at his funniest. Shout! brings Born in East L.A. to Blu-ray with a respectable A/V presentation but a surprising set of bonus features sure to please fans of the film. Call up a few Disco Bunnies for movie night and check it out. Recommended.